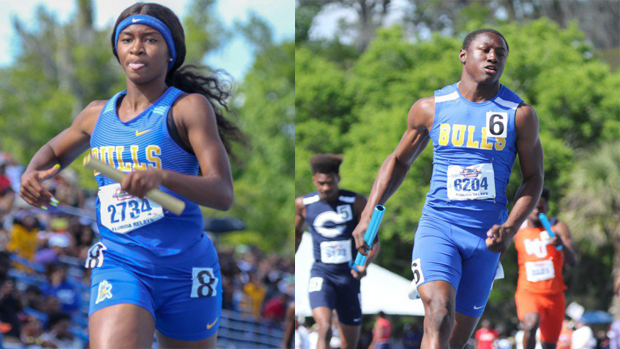 Miami Northwestern swept both the girls and boys 4x100m relay finals at Florida Relays. The Northwestern Lady Bulls took off and finished with a 45.72 -- a Florida No. 2 time and current US No. 3 time. The Northwestern girls have hopes of hitting the sub 45 mark before the season is over. As the reigning FHSAA 3A team title champions, these ladies have put themselves in a situation to go for that goal and defend their title. On the boys side, we saw a similar race with the Bulls taking the win as well in a Florida leading time of 40.36 to win on the Percy Beard track. The Northwestern boys had a dramatic lead after their third exchange heading to the finish and edged out Miami Columbus by over a second. The Bulls not only pulled off a Florida leading time, but also a National leading 4x100m relay time and have hopes to drop their 40.36 down under 40 before the season comes to a close.